Is This The Beginning Of the End For the Duggars? The Duggar family appears to be a wholesome family of 19 children and their super religious parents on the TLC show 19 Kids and Counting. While the family is no stranger to scandal, the most recent scandal to hit the news may be the one that causes the downfall of their television empire. 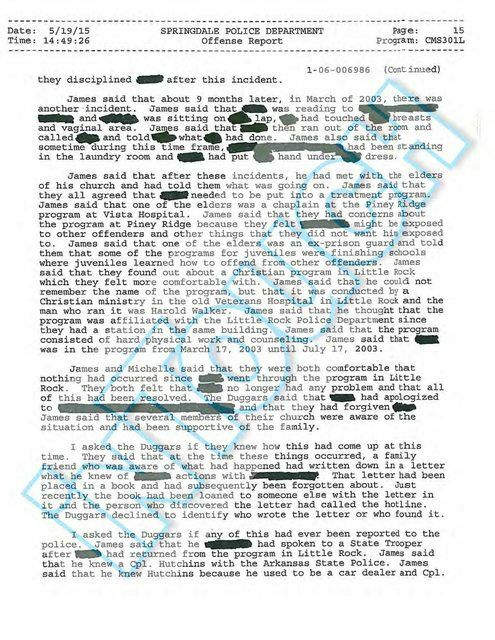 The long and short of it is that oldest brother Josh Duggar touched his sisters in inappropriate places when they were minors, as well as another young woman, and Jim Bob didn't report it to the police until a year later. The family has issued a statement about how Josh has learned from his mistakes and the whole family has asked for forgiveness and gotten closer to God, etc. It sounds like a desperate plea for people to still respect the family, but they probably do believe what they're saying. Josh has now resigned from his job at the Parents Television Council, and that's a good thing because he hardly fits the profile for the ultra conservative group now. Not that the PTC is a good thing in the first place, but that's another story. I want to approach a sticky subject here, and hopefully I am handling this respectfully. Is it possible that the conservative nature of the Duggar household led Josh to approach urges that he might have otherwise been able to address in a healthier manner? Wasn't he sheltered from spending time with females outside of his family, and could have approached sexual curiosity in an appropriate way (with a consenting person outside of his family)? People under 18 engage in sexual conduct all the time - did the conservative nature of the Duggar family actually encourage this type of behavior? What Josh did was wrong, wrong, wrong. WRONG. 100% wrong. Can I clarify that more? He was wrong. He was inappropriate. He should not have done that, and his actions harmed others in an inexcusable way. But we also need to focus on the situation in his household - why didn't his parents stop the situation immediately, pull him out of the household for counseling, and get him the help he needed after this happened one time? Why did it go on for a year? What kind of message did that send to Josh? Yes, they sent him away for some temporary hard labor, but he should have been removed from the home, sent for intensive counseling and rehabilitation, and maybe allowed back in, depending on circumstance. If Jim Bob and Michelle stopped this right from the start, Josh may have not been able to harm five people. If they provided some kind of sexual education, not just fundamentalism, perhaps this could have been avoided altogether. I can understand (sort of, anyway) the struggle they may have felt when they realized they should turn their son over to police or send him away for counseling, but they needed to do much more than they did. What kind of message did it send when Josh wasn't stopped from his actions? Certainly not a clear one. Certainly not the right one. So, That's It For American Idol! As we've all heard by now, American Idol is ending. The show that skyrocketed Kelly Clarkson to stardom in 2002 is ending its run. So what do we think about this? I think it's time. With competition like The Voice, America's Got Talent and everything else, the show has run its course. Plus, we all know Kelly Clarkson, Carrie Underwood, and even some non-winners like Ruben Studdard, Clay Aiken and Kimberly Caldwell, but the show has become a pathway to nothing more than relative obscurity and Z-list temporary celebrity. And with the rotating panel of celebrity judges who now get more press for fighting than the contestants do for singing, it is definitely time to sign off the air. Not to mention that the one constant, Ryan Seacrest, has so much money that he never has to work another day in his life. Anyway, it's time for American Idol to bow out as gracefully as possible so we're left with the positive memories, and we don't run into any more From Justin to Kelly moments. And Gary Shirley Named His Daughter.. It's not my favorite spelling, but it is cute. For those who are curious, according to SheKnows.com, Emilee means industrious; striving. So this is sure to be one tough kid. This name fits well with Gary's first daughter's name, Leah.